I'm sure you could imagine my excitement when I received a small package in the morning's post containing the Leuchtturm 1917 Reported Notepad I had recently ordered. Well, even though I've not yet had a chance to put it to the test, here are my preliminary thoughts. Excuse me if I seem a bit less than enthused. 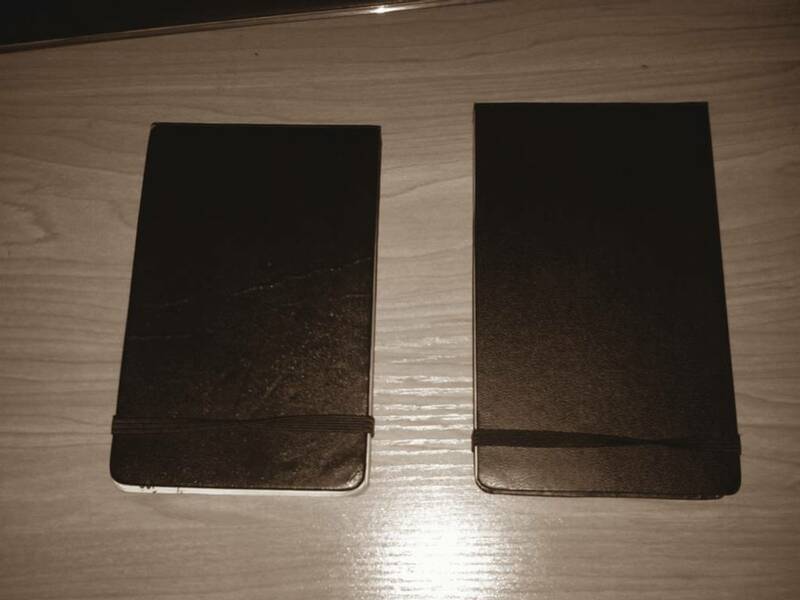 Let's start with a closer look and comparison with the Moleskine Reporter. The Leuchtturm is the same width as the Moleskine (9cm) but slightly longer (15cm vs Moleskine's 14cm). I haven't yet put it into a jacket or pants pocket but I doubt that the extra centimetre in length is going to make any noticeable difference in carrying the notebook, unlike another brand I tried that was a little too wide for easy storage or quick retrieval. Sadly, this is where my disappointment arises. Firstly, while the blurb states '94 pages, 188 sides', it doesn't tell you that the back sides are unlined. So, really, that's only 94 pages then. Secondly, while the paper is supposedly slightly heavier than that used in the Moleskine and 'ink-resistant', the pages seem thinner and the ink from the lines I've ruled has come through the other side slightly. Even if the back sides were lined, I'm not sure it would be particularly useable - at least with my pen of choice (the Uniball from Mitsubishi Pencil Corporation). 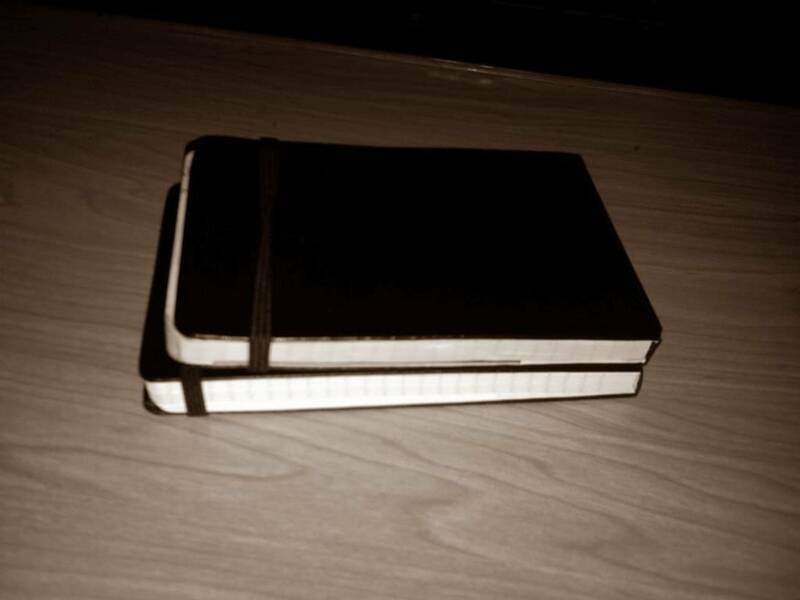 However, you'll note how the Moleskine's binding has broken in the above photo. The Leuchtturm seems to open up to a greater degree and hopefully this isn't going to be a problem. Anyway, I guess most of you are thinking "it's only a notebook, what's the big deal?" No big deal really. I was just hoping that my search for the perfect notebook might have come to an end. While other reviewers favourably compare the Leuchtturm to the Moleskine, I (perhaps) was expecting too much. Does this mean I won't use it? Hell no! I look forward to putting it through its paces over the coming months and year. We'll see how it holds up and I'll post a subsequent review sometime down the track. And I'll probably order one of the Leather Journals for my novel-writing efforts (yes, that project is back on again). You should read a blog post I wrote for www.pocketblonde.com about the search for my perfect notebook. Thanks for the heads-up. 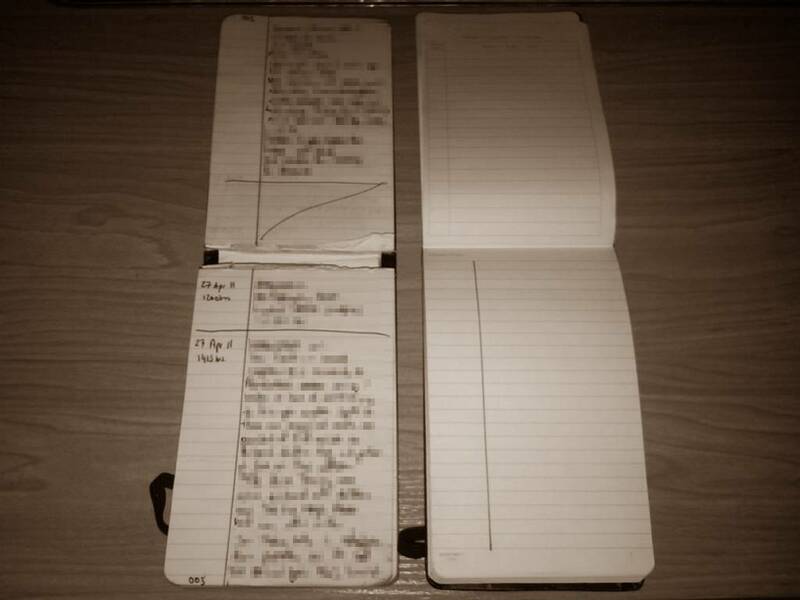 Actually, for some time I had been toying with the idea of creating my own notebooks - complete with sidebar for date/time entries and numbered pages, as well as a choice of thicker paper. But, like most such musings, I had done absolutely nothing about it. Your post shows, if nothing else, that the idea isn't stupid and can be achieved relatively easily so no more excuses: I'll start making enquiries next week with local vendors. Well to number the pages would've meant changing the typeset for every page and that would've been prohibitively expensive... doubling the cost of the notebook inserts. However, my bindings last forever and the leather is sublime compared to moleskines (whos cover you cant label). Moleskines look elegant and are a bit lighter than my little blak book, but they fall apart and don't include a penloop of all things. 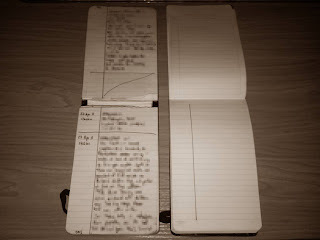 Moleskines and the like are elegant and fairly cheap solutions, but notes are important, and should be a manageable when making them, recalling them and archiving them. Even at double the price, they'll still work out cheaper than Moleskine, per unit anyway. Of course, there will be a minimum order to contend with. Well the minimum order isn't a bad as long as you get exactly what you want. The way I see it is that if I fill out one insert a month (which would be a pretty busy month, I have enough inserts to last 8 years.The only potential problem would be if you wanted to change the inserts after a certain amount of time. Then you're stuck with more minimum orders. Anyway, take your time getting the insert just right. The dimensions were easy to get exactly right, even when using an out of state company. The page layout (lines & spaces and graphics) were a little difficult to predict w/o looking at the finished product. The hardest part though, was get the thickness correct (dictated by the number of pages) and the size of the coil binding. Ultimately though, well worth the time and expense for something you could very well use everyday for the rest of your life.